- One or both of the sensors on the rear bumper is blocked by dirt or snow or a foreign object. - Driving in rural areas where the BSD sensor does not detect another vehicle for an extended period of time. - When there is inclement weather such as heavy snow or rain. If any of these conditions occur, the light on the BSD switch and the system will turn off automatically. When the BSD canceled warning message is displayed in the cluster, check to make sure that the rear bumper is free from any dirt or snow in the areas where the sensor is located. Remove any dirt, snow, or foreign material that could interfere with the radar sensors. 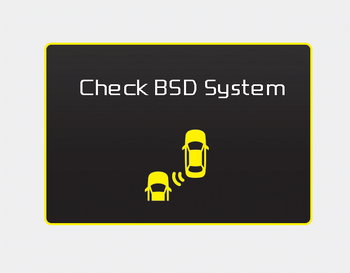 After any dirt or debris is removed, the BSD system should operate normally after about 10 minutes of driving the vehicle. If the system still does not operate normally have your vehicle inspected by an authorized Kia dealer. If there is a problem with the BSD system, a warning message will appear and the light on the switch will turn off. The system will turn off automatically.We recommend that you have your vehicle inspected by an authorized Kia dealer.